Many people are absolutely miserable with their dentures. They don’t fit correctly. They move around, food gets under them, and they may slip out at embarrassing times. Sometimes these patients are in a quandary. While they know dental implants are the best solution to their problems with dentures, implants may be out of reach with their current budget. Dr. Burba wants to have a solution for his patients in that predicament. 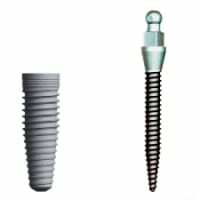 At Burba Dental we offer two options for affordable dental implants. The first is mini implants. As you can see from the picture, mini implants are about 1/3 the diameter of standard implants. The smaller diameter makes the surgery much simpler, which in turn saves you on surgical fees and recovery time. It does have limitations, and you need to be careful in selecting a dentist that understands those limitations. Mini implants may be able to stabilize a denture in some situations, but they are not as strong as standard dental implants and cannot support a tooth. A second affordable option is implants to stabalize snap on dentures. The cost of implants is directly related to the number of implants you have placed. Therefore, if you have two standard implants placed instead of six, your cost will be significantly less. Two implants are enough to stabilize a denture to where you wouldn’t have to worry about them ever falling out in public again. Another benefit is the treatment is completely upgradable. While implants are the better treatment for replacing your teeth, if you can’t afford all of them, getting two is a good start. This way you can work your way up to getting more as you’re able. To learn more about the importance of dental implants and how they help you avoid facial collapse you can click here to read our dental implants page. If you have questions about dental implants and about whether or not you would be a candidate, but do not want to commit to a complete examination, we’d be happy to see you for a complimentary consultation. Just call or visit our request an appointment page.